I follow this little trick when I’m shopping – if there are ingredients in the product I can’t really pronounciate, then it’s not entering my shopping basket. And to be honest most of the bakery eisle is in the no entry category. Even if they are from better ingredients they usually are full of sugar. If you are also looking to try something healthier this Easter, I would recommend baking and cooking at home. But don’t worry, making healthier versions of your favourite Easter goods doesn’t have to require hours in the kitchen. Or expensive ingredients. 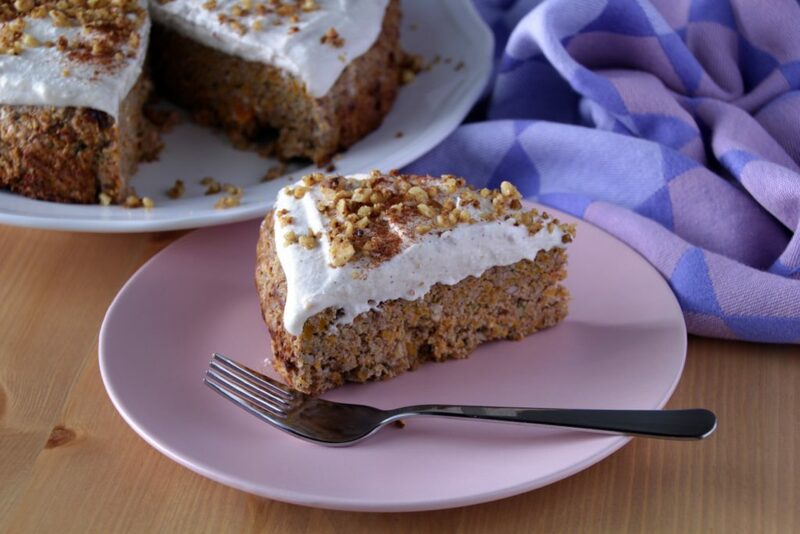 This Carrot Cake (Paleo, Sugar-Free) is made only from few ingredients, it’s sweetened only with banana and carrots (there is even one more hidden veggie to make it even healthier and more moist, but no one would know) and it’s super simple to make as usual. But if you think that you couldn’t make it without the sweet taste, there are options to use sweeteners in the recipe. I would probably suggest using honey out of all. 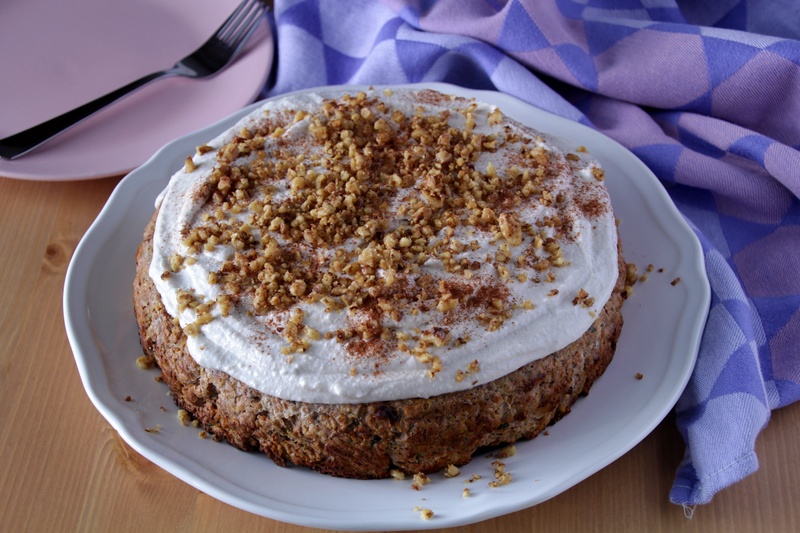 But I tested the carrot cake on classic sugar eaters and even for them the banana and carrot used made it sweet enough, so try at least the cake itself without adding any sugars and then maybe play with the frosting a little. Why not to try something different and healthier this Easter? This Carrot Cake (Paleo, Sugar-Free) is so nutritious you can have it even for breakfast. Peel the carrots and bananas. Then cut the carrots, zucchini and banana in pieces. They don't have to be too small, just enough to fit in a food processor. If you want to make sure nobody would know there is zucchini in the cake, just peel it before blending. Place the carrots, zucchini and banana in a food processor and blend it into small chunks (of a rice consistency not puree). Transfer the mix into a bowl. Add the spices (optionaly a sweetener) and eggs and mix everything together. Add the coconut flour and mix thoroughly. Line a cake dish with creased baking paper - take the needed amount of baking paper and crease it in a bowl. Then straighten the paper back and line the cake form with it. Place the batter in the cake form and level it out with a spatula. Place the cake in a preheated oven for 160°C and bake it for 1 hour. Take the cake out of the oven and let it cool to a room temperature before taking it out of the form. Decorate the cake with your favourite frosting. I used Vanilla Cashew And Coconut Cream Frosting (Paleo, Low Carb, Vegan). Store in the fridge for up to 5 days (about 3 days with the frosting). It also freezes very well. I cut mine in single servings, freeze them up and just leave them to thaw in a room temperature before serving. It's possible to freeze the cake even with the frosting, it just wouldn't look as good and the frosting might get a little bit more grainy. But won't affect the taste. Soak the cashews in a glass jar with water for at least 4 hours (I usually do it overnight in the fridge). Place the can with coconut cream in a fridge overnight, that would help to separate the cream from the coconut water. Open the can and take the thick layer of the cream out and place it in a food processor. Keep the coconut water for later. Strain the cashews and place them also to the processor. Add the vanilla extract and 5 tbsp of the coconut water and blend everything until smooth. If you find the frosting too grainy or thick add 1 tbsp of the coconut water at a time until you find your ideal texture. The frosting will get thicker in the fridge, but it shouldn't be too runny. Place the walnuts in a food processor and pulse it few times to crush them in smaller pieces. Place a small pan over medium heat, add 1 tbsp of ghee and let it warm. Add the walnuts and roast them up while continuously stirring for 5 minutes. If you are using sweetener add it to the walnuts for last minute. Let the roasted walnuts cool completely before using to decorate the cake.